DREAM BIG Transitions created for Mabel! This year the School Counseling Department will be launching new transition conferences entitled: Dream Big! During these conferences parents of rising kindergartners, sixth graders, and ninth graders will sit down with the counselor and talk about their dreams for their children, how Mabel can help them achieve those dreams, and what some of the hurdles might be for their family. Students currently in grades 5 and 8 will also have a Dream Big conference with the counselor. Other transition activities will include the new 9th grade transition class for current 8th graders, one on one meetings with 5th graders with the counselor, and the amazing kindergarten orientation provided by our kindergarten teachers each year. We are so excited about working with our students to help make transitions more smooth and easy. 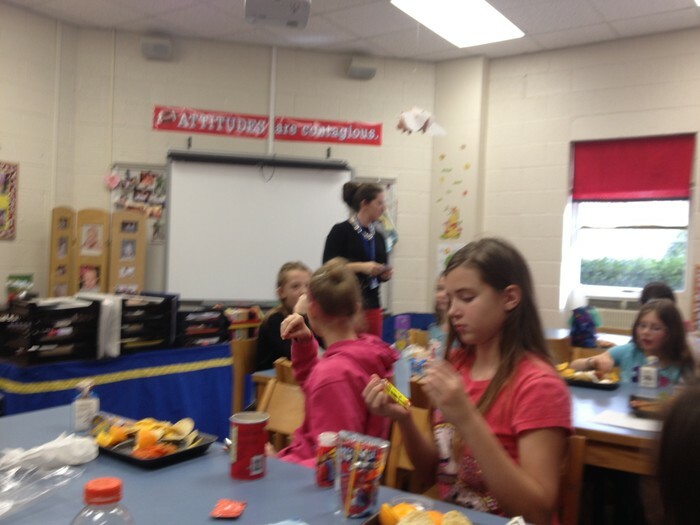 Mrs. Welch hosts career cafe about the career of school counseling. Mabel's artwork displayed at ASU games! 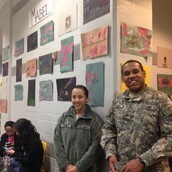 During heroes day at an ASU basketball game Mabel School student's had their art work displayed. Beginning this spring, Mabel 6th and 7th graders with have the opportunity to participate in the national GEAR UP Movement! GEAR UP (Gaining Early Awareness for Undergraduate Programs) is provided for through a partnership grant with Appalachian State University! Gear Up is a discretionary grant funded through the United States Department of Education designed to increase the number of students who are prepared to enter and succeed in postsecondary education. The mission of the NC Appalachian GEAR UP initiative is to accelerate the academic achievement of middle and secondary school students in the Alleghany, Ashe, Burke, Clay, Graham, Madison, Rutherford, Swain, Watauga, Wilkes, and Yancey Counties in North Carolina, so that increasing numbers will graduate from high school and enroll and succeed in college. The following Watauga County Schools are participating in GEAR UP: Mabel, Bethel, Cove Creek and Green Valley. 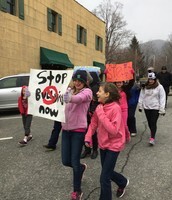 On February 12 a large group of students, approximately 75 of them, walked down King St and through the campus at ASU holding signs with an anti-bullying message. This was part of a school counseling unit focusing on students making change in their community and connecting it to Martin Luther King Jr’s many contributions. Prior to the march students watched portions of the Teaching Tolerance film “Mightly Times: The Children’s March of Birmingham, Alabama”. Taking the idea from 3rd grade teacher Bronwyn Merritt , students then chose a problem that they would like to change. All three classes chose bullying. 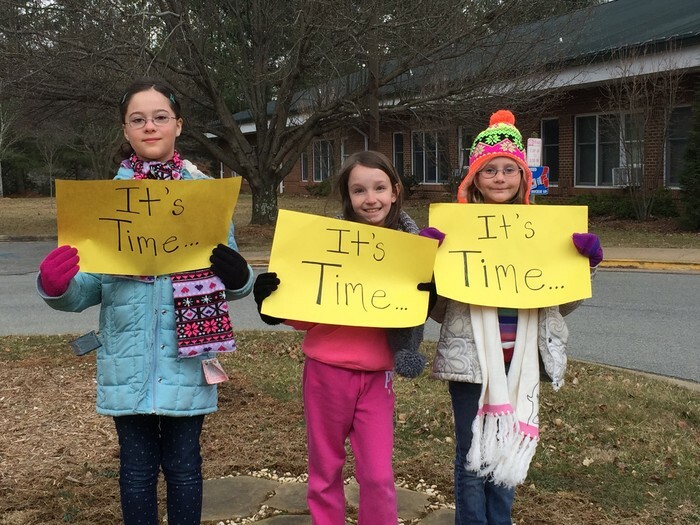 On the day of the march three students stood outside their classroom windows holding signs that said “It’s Time” just as was done in the film. 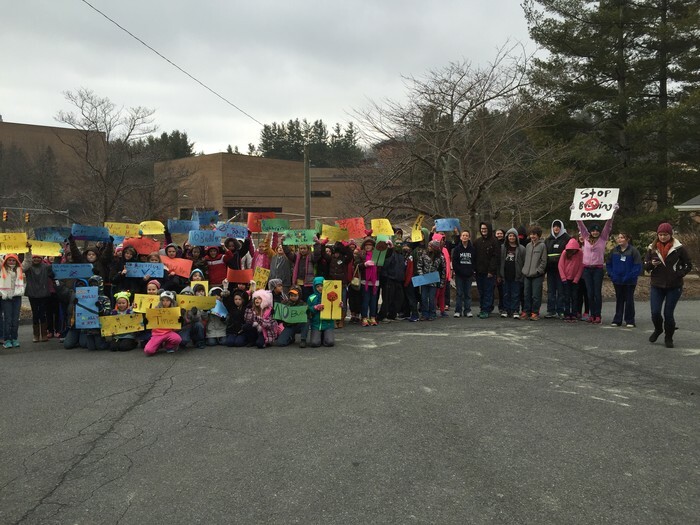 Students then congregated around the flag pole to hear a motivational speech delivered by 5th grader Ella Ugenti. Ugenti talked about how we’ve all probably been bullied or seen someone being bullied, but instead of being a bystander we need to stand up and be an upstander. Students were able to debrief and talk about their experience immediately after at Owens Field House and then had lunch in Roess Dining Hall at Appalachian State. This project not only gave these students the opportunity to make a difference, but it also allowed them to have some time on a college campus. We felt this way we could give the students an all-around amazing experience. 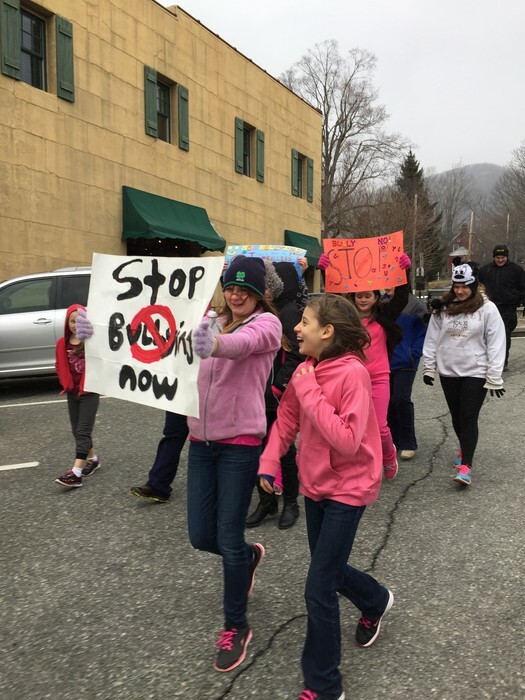 Mabel's march was featured in the Watauga Democrat and mentioned again the editor's "Our View" section. Mabel is proud to announce that it has implemented the Signs of Suicide program. 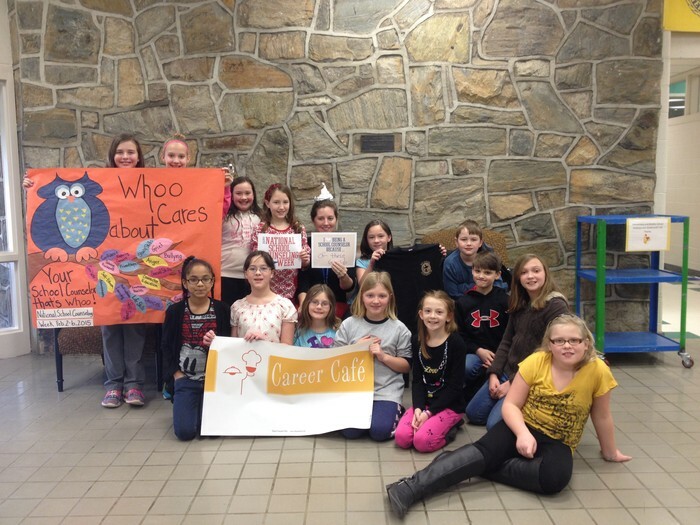 The school counseling department pursued this program early in the school year. We were able to secure all materials for free! 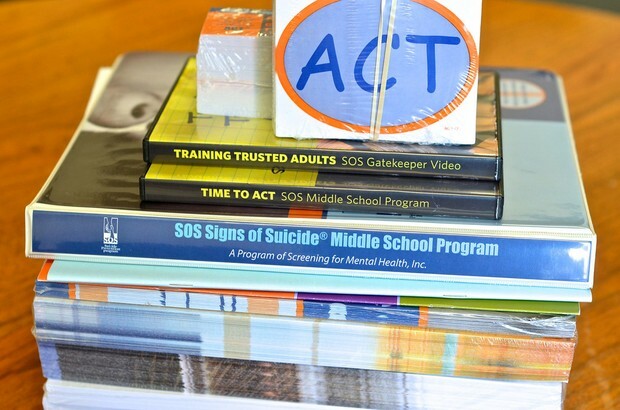 All faculty and staff, as well as 6th-8th grade students, went through a 45 minute training focused on the ACT method of helping someone who feels depressed and/or suicidal. ACT stands for Acknowledge, Care, and Tell. Each student received a card with the information as well as a student newsletter. A parent training on this program will be March 23rd at 6pm. The Mabel School Counseling Department offers group counseling, individual student planning, classroom presentations, parent workshops, career counseling, and referral services. Suicide is the third leading cause of death for youth between the ages of 10 and 24. 16% of teens have contemplated suicide. It is important that parents know and understand the signs of depression and suicide. This workshop will explain the Signs of Suicide program and give parents tools to help them identify depression in their own students. This program is for parents of all ages.